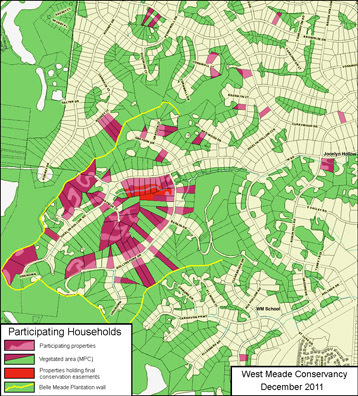 The West Meade Conservancy’s plan is simple: West Meade landowners who choose to participate sign a registration form identifying the portion of their property to be covered by a conservation easement which limits the use of the land in perpetuity. A first group of easements was made legally final on December 4th, 2011. Property by property the groups of easements will grow. Neighbors will inform other neighbors. The area to be preserved will expand as new people join in the effort of preservation (see map below). The goal is to create an expanding collection of contiguous conservation easements to protect wooded areas, wildlife habitat, and the watershed. The easements will be maintained in perpetuity by The Land Trust for Tennessee, though the area will remain private and residential. 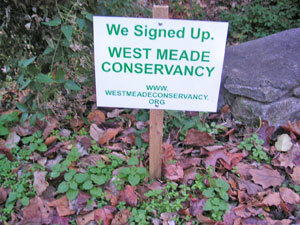 If you own wooded and/or creekside property in West Meade, fill out and mail in a Landowner Registration Form accompanied by a marked Lot Map [see “How to Get the Dimensions of Your Lot“] or use the “Contact Us” link. Registrants may also request yard signs. If you don’t own West Meade property with woods and/or creek but wish to support the WMC’s mission, choose options on the “Get Involved” link. Use the “Contact Us” link to join the WMC’s gmail list.